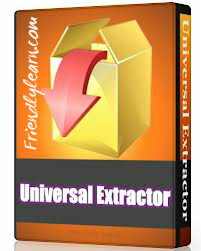 Friendlylearn.com Provide Universal Extractor is a program do to exactly what it says: extract files from any type of archive, whether it's a simple zip file, an installation program, or even a Windows Installer (.msi) package. It is not ment to replace any general purpose archiving program. It can, however, extract any type of archive, regardless of source, compression method, etc.